The Therapeutic Horticulture Program at Wilmot Gardens is limited to indoor greenhouse gardening at present because of the absence of an accessible outdoor venue for gardening activities.We envision a 6,000 sq. ft. working garden with vertical wall planters, trellises, raised and at-grade planters, espaliers, and wheelchair-accessible planters to facilitate hands-on involvement outdoors. The plan includes shelters from both rain and sun and a centrally located water source for drinking and gardening activities. The incorporation of extra-wide sidewalks to accommodate wheelchairs, walkers and other mobility devices will ensure 100 percent accessibility for our participants, a guiding principle for all facilities at Wilmot Gardens. Lighting will also be incorporated in the design to permit evening activities and special events. The addition of a spacious, outdoor working garden will permit at least a doubling or more of the number of individuals we can serve, and it will greatly expand the types of gardening activities we can provide. After the completion of the Chapman Healing Garden near the south side of the conference center, Wilmot Gardens plans to expand visual and physical access to the Chapman Healing Garden from the conference center by constructing an adjacent patio area overlooking the site. The patio area would provide additional space for the public and for therapeutic horticulture participants to relax and enjoy the gardens. This construction project would also include some much needed updates to the conference center itself, including the creation of direct access to the patio through French doors opening to the outside, thereby creating a more cohesive reception space that takes full advantage of the center’s natural setting. 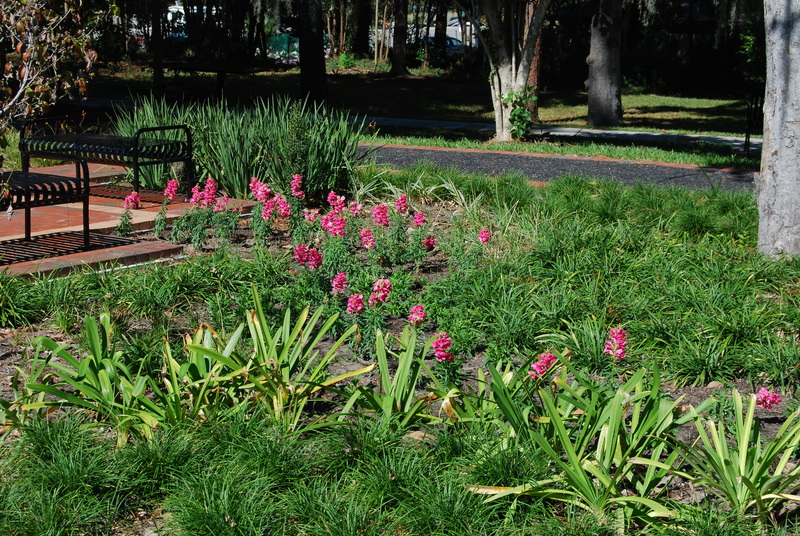 As a living historic landmark, Wilmot Gardens strives to be an accessible and welcoming space for the public. To make the gardens more secure, especially in the evening hours, and to enable the gardens to host evening events, additional lighting needs to be placed along the main pathways. This would allow visitors to enjoy the gardens at dusk and into the early evening, especially when it becomes dark earlier in the fall and winter. In addition, the small parking lot to the west of the conference center needs to be paved to create additional parking and easier access to the gardens for individuals with mobility issues. This set of renovations would improve Wilmot Gardens’ ability to serve the entire local community. To find out more about any of these projects or support our efforts, please contact Bailey Hillman at bahillman@ufl.edu or 352-273-5832. 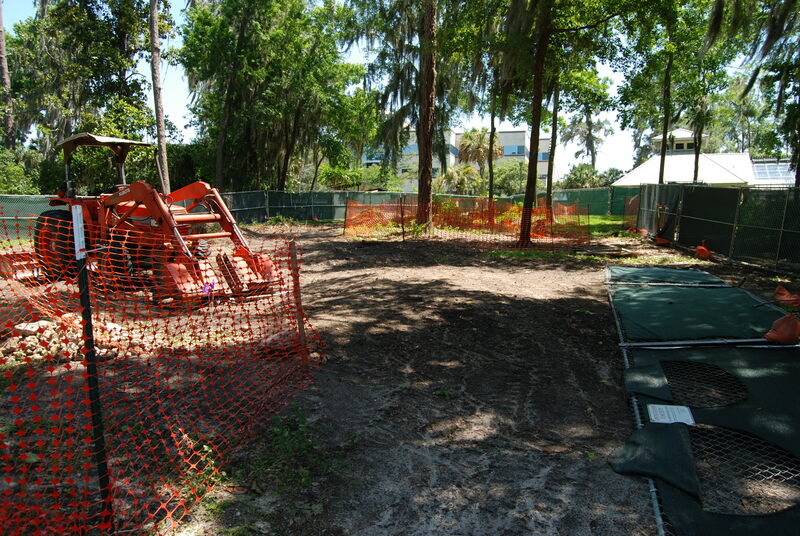 The Chapman Healing Garden is currently under construction near the south side of the Conference Center at Wilmot Gardens. The Chapman Healing Garden will provide another venue for patients and the public to experience the therapeutic benefits of green spaces and will expand Wilmot Gardens’ diverse garden settings. Specifically, the garden will focus on providing an abundance of sensory experiences related to plants, including their fragrance, texture, shape and color as well as auditory stimulation from a water feature. The Chapman Healing Garden was made possible due to a generous donation from The Dr. Jules B. Chapman and Annie Lou Chapman Private Foundation. 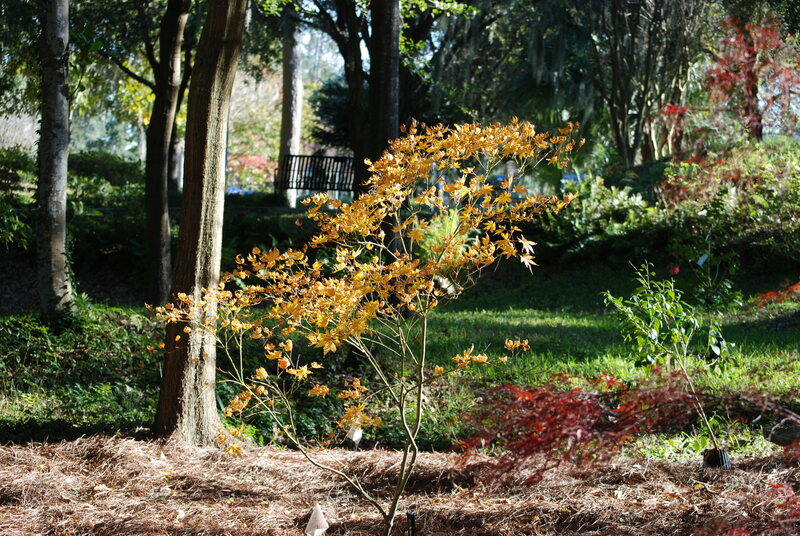 The Japanese Maple Tree Garden, which features a collection of more than 30 rare Japanese maple trees, is nestled near the center of the gardens. Identifiable by a Genkan, or traditional Japanese entryway constructed of redwood and cedar, the Japanese Maple Tree Garden adds a new dimension to Wilmot’s foliage, with brilliant colors in the fall and spring and delicate green leaves during the summer. This garden was made possible by a donation from Dr. and Mrs. Johannes Vieweg, who also contributed the maple trees from Dr. Vieweg’s personal collection. This greenhouse is one of the most important additions to Wilmot Gardens since the restoration efforts began in 2006. The facility provides more than 2,700 square feet of climate-controlled space for gardening activities as well as additional office and reception space. It also houses the therapeutic horticulture program, which allows more individuals to benefit from the healing power of gardening and provides a venue for the gardens’ empirical research into the benefits of therapeutic horticulture. 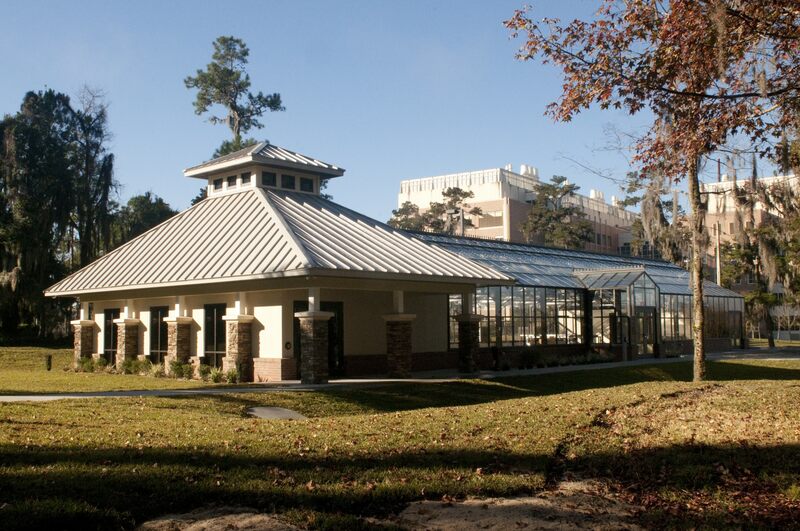 The greenhouse was made possible through generous gifts from private donors and gifts in kind. 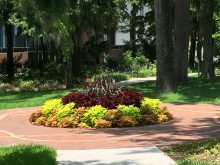 A 60-meter accessible track made with joint friendly materials graces the southern edge of the gardens, quite near the UF Shands Medical Plaza and the Davis Cancer Pavilion. Built for a research project by the Institute on Aging to examine the effects of exercise on cognitive function in elderly adults, it now serves as a shady activity zone and gathering area for patients, staff, faculty and the public. The track, which is open year-around for all to use, encircles a lovely garden and patio replete with seating. A beautifully patterned brick paver hub that is reminiscent of a DNA helix and features an ever-changing seasonal garden bed links several of the gardens’ pathways, making the garden more accessible to those in wheelchairs and with mobility issues. The plantings are changed out multiple times a year.